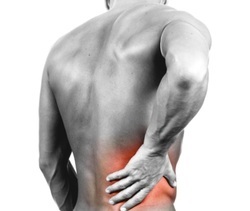 The nerve-rich facet joints on the back side of each spinal bone area a common cause of back pain. If these pairs of interlocking "fingers" aren't moving right, they can cause painful symptoms. The discs between spinal bones can be a source of pain, too. These rings of fibrous tissues act as spacers, connectors and "shock absorbers" for the spine. Trauma cab cause the soft, pulpy material in the middle to bulge or herniate, putting pressure on delicate nearby nerves. Once you know the cause, you have several choices. One approach is bed rest. But research shows that prolonged bed rest can actually delay the recovery and make the problem worse! Physical therapy is another option. But exercising spinal joints that aren't working right is like continuing to drive your care with misaligned tires! Another choice is to numb or cover up the pain with drugs. While drugs can offer temporary relief, they can't correct functional problems of affected spinal joints. The most drastic measure is surgery. A laminectomy cuts off the offending facet joints, leaving the spinal cord exposed! A spinal fusion cuts out disc tissue and immobilizes the joint. While there may be times when surgery makes sense, it's expensive, risky, and more than half of all back surgeries fail. *Content on this page can also be found in the Backpain brochure at our clinic ©2003 Patient Media, Inc.